Ever been in the middle of something important, something that you finally figured out, then BOOM you are hit with a loss of self-esteem? It is kind of like when you are blowing up a balloon; you use all your air to blow up this great, perfect balloon, you tie it tightly and then someone comes along and pokes it with a sharp object and BOOM it is ruined. Not only is it ruined but the blast of sound scares you intently so much so that you really don’t want to blow another one up again. When we are doing great things for God, this is exactly what happens. God’s Will does not come without struggle (and popping of balloons). Then Jesus said to His disciples, “If anyone wishes to come after Me, he must deny himself, and take up his cross and follow Me. 25″For whoever wishes to save his life will lose it; but whoever loses his life for My sake will find it. When we say “yes” to God, the devil does not like it. That evil spirit will do everything he can to get in our way. He will use our circumstances, our minds, our friends and our family to get us to turn away from God’s Will. He uses such simple everyday things, that we overlook it as nothing, but it is more than nothing. Pete and I have been making some pretty large life changes in our household. I am not going to go into detail, but I can tell you this: these changes are hard and they bring doubtful thoughts to Pete and me all the time. I have been trying to push away the worry and fear, and to turn to God’s Light. I know that God will keep us on the right path as long as we don’t let those doubtful thoughts overtake us. In my mind I have been trying to see God’s brightly lit pathway for us. I have been listening intently when I pray, when I am in church and when I am talking with friends to hear God’s message repeated over and over again. My evil through all of this has occurred in my mind. That voice is constantly trying to take my self-esteem and crush it. As I feel that voice coming on, I immediately go to prayer. Stop the doubtful thoughts, Lord. I know we are following your beautiful pathway. Block us from the evil one. Let me see You only and think of You only. I need your strength. I know this is going to be a difficult road, but I know if I pick up this cross and carry it, you will be there at the finish. And of course my ultimate goal is to do Your Will so that I may spend eternal life with You. When Jesus told Peter to walk on the water, and Peter followed His instructions, then it was amazing. The problem occurred in the middle of his task. 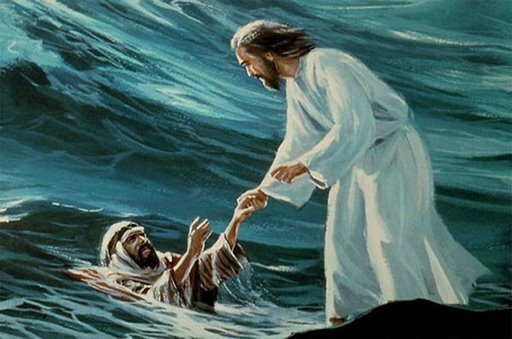 Peter doubted, and we saw what happened when Peter doubted; he fell into the sea. When I doubt that I am doing God’s Will (when I know it perfectly well – just like Peter did), I am allowing evil to win, and I fall. I know that Jesus will pick me up and save me, but I lose so much when I doubt. I could finish that walk on the water feeling energized and excited that I allowed Jesus to help me do the impossible. I break that feeling when I doubt. I miss out on the good part of faith. I allow the devil to win. Doubt is sneaky, so we must be armed and ready to fight it off. Push it away. Pray for God’s guidance. Allow yourself to feel confident and energized that you are doing God’s Will. His Will may not be easy. It may look a lot like walking on water, but when you accomplish it, you will praise Him for the strength. You will share it with the world. You will be energized to do it all over again! This entry was posted in Faith, Family, God, Jesus, Religion, Social Justice, Uncategorized, Women and Christianity and tagged doubt, doubt in God's plan, Faith, fear, God's will, Peter walking on water, self-esteem, worry. Bookmark the permalink. Great post you have chosen. I can identify with the story. I often think about Peter and how when he took his eyes off of Jesus he saw himself sinking. It’s when we stay focus on Jesus that we don’t sink. And though Peter began to sink Jesus did not let him sink, that is how He does us He never will let us sink in our storms.